I found this March 2002 post by Bill Kaman on the Ovation Fan Club forum. I save it here, just in case, because it’s precious. And in 1974 there was the coming of the applause. And its bowl was made in a compression heated mould from a mixture of polyester resign and chopped glass fibres. And it was called SMC but the New Hartford Ovations stayed with the cloth. In 1982 there was an experiment of making guitars in North Carolina and all the bowls were made there from the SMC. And that’s where it is today. Now as a further note the cloth bowls were about 35% glass when all was said and done. The SMC (sheet Molding Compound) is a layer of resin that looks like taffy and had 1″ chopped fibers imbedded in it. Those bowls are also about 35% glass. The HMC is made with fibers 1.5″ long and are also the same percentage. We found that the longer fibers sounded better, more like the cloth bowls that were a PITA to make. Material costs weren’t a real factor but mfg and scrap rates were. HMC was better on both. There was a phase over from cloth the SMC/HMC. The Adamas 2 were all SMC from the beginning. the Adamas 1 was the last to switch from cloth. All things being equal the cloth probably sounds better. But things are never equal are they? 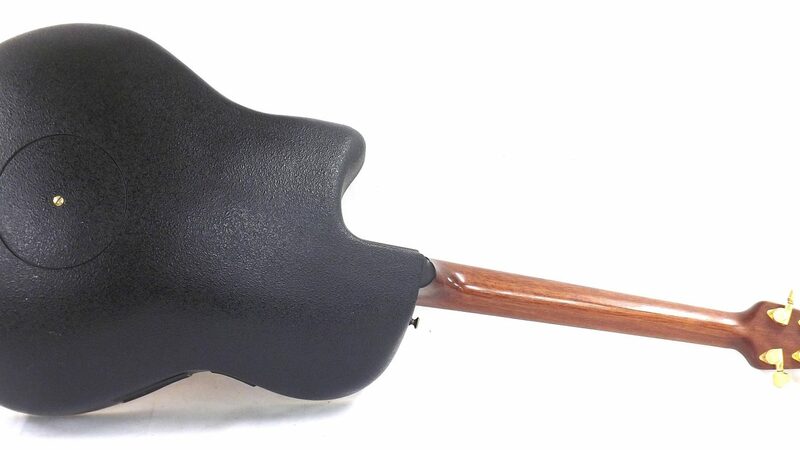 The finish, top thickness, grain, brace patterns, neck material, how it’s joined to the bowl, type of rosette, bridge material all affect the sound. So I’ve heard cloth bowls that were last in the bow-wow 500 and HMCs that were in the top 10. The next step to be taken is to have the HMC made with micro-baloons in it. This has been available for several years and will reduce the weight of the bowl about 30%. Why was it not done? Because of the aluminum K-bar in the neck. The cloth bowls, tension rod neck guitars were about 2 pounds lighter than the current guitars. Switching to the lighter bowl will make the guitar neck heavy so until a new grafite K-bar or some other system gets developed you’ve got the heavy bowls. The Q solves all these problems by the way, grafite bowl top and neck and sounds killer and weighs 4 pounds. So come on guys at the Big O, get the finger out and bring a better guitar to market. Oh and while you’re at it, offer it in a straight acoustic version or electric with the bridge pickup only, ie outboard preamp. Those things add alot of weight too. Lighter is better.